Whether you're a connoisseur or you just have an appreciation for the finer things, you can effortlessly pour wine at its ideal temperature! - Rapid cooling and keeps your wine at the perfect temperature. - Easy to store, it can be kept in the freezer, ready for your next bottle. - Eliminates messy and bulky ice buckets - No wet marks or drips on your table! THROW AWAY THOSE MESSY CHILLING ICE BUCKETS! THE NEW WAY TO CHILL YOUR WINE IS HERE! 100% SATISFACTION GUARANTEE: We stand behind our product. If you're not completely satisfied for any reason, return it for a full refund within 30 days of purchase--NO QUESTIONS ASKED. If you have any problems or concerns, feel free to contact us. ORDER YOUR SET TODAY, RISK FREE! THE SECRET TO A PERFECT WINE - Newward Wine Chiller Stick, a combination of wine bottle chiller, filter and pourer, allow you enjoy a glass of perfect chilled wine at optimal temperature. You also get a classic "waiters" corkscrew and an extra stopper. Its elegant design will add a level of refinement to your wine drinking experience, is the perfect gift for wine lovers. NOT JUST COOLING - Built-in dual intake aerator mixes extra oxygen to maximally enhance wine flavor. 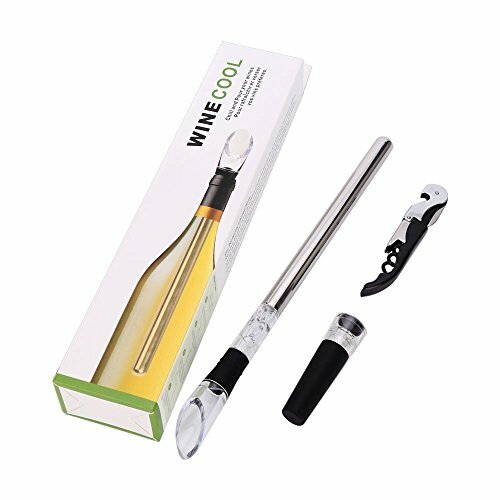 Stainless steel wine chiller rod makes the taste of your wine or drink won't be diluted by melting. Drip-free pouring spout to avoid any drips or spills. Plus extra rubber stopper to keep your wine fresh. SIMPLE TO USE - After cleaning, place the dry chiller stick in the freezer for minimum of 2 hours, then open your wine and let it aerate for 15 minutes, pour out some wine then insert the chiller stick into the bottle, it will keep your wine perfectly chilled for up to an hour. ULTRA DURABLE - FDA-certified, premium food-grade stainless steel and acrylic, uphold wine aroma at the optimum level. A great size to fit in all standard-sized wine bottles and easy to store. You no longer have to deal with wet wine bottles or the mess that comes with preparing and using an ice bucket. PERFECT WINE ACCESSORY - Light and portable Newward 3-in-1 chilled stick is an absolute must for parties, gatherings, celebrations or you just want to relax. Also, it's a great gift item for your friends, families and loved ones. We recommend you order more than one, because there is always more than one bottle of wine or champagne you can chill. GET TODAY'S SPECIAL PRIVILEGE, Purchase 2 save 5%, Purchase 4 or more save 10%. If you have any questions about this product by Newward, contact us by completing and submitting the form below. If you are looking for a specif part number, please include it with your message.